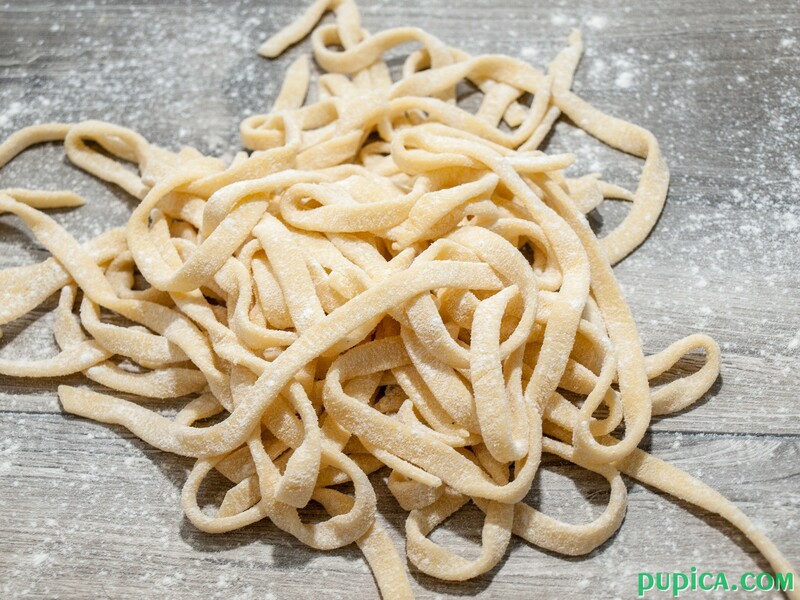 I post this homemade tagliatelle recipe today, although I made them days ago when I posted the colored spaghetti recipe. I made 250 g of spaghetti and 250 g of tagliatelle. I had just 5 eggs in the fridge so I couldn’t prepare more pasta as I usually do. If you don’t have a pasta machine or you want to prepare it the old fashioned way with a rolling pin and cutting it by hand it will take you more time and you will have lots of cleaning up to do later. You will need a flat, large surface where you can get messy because you will probably make quite a lot of mess the first few times… I think I’m writing too much about the mess right now, so you will probably give up on this recipe by the time you finish reading this post… 🙂 No worries, they are really worth it! If you have a food processor at home, you can easily prepare the dough for pasta, but if you don’t have one, just follow those few simple steps in the recipe. The first few times I had some trouble beating the eggs and mixing them up with the flour in the flour well, the still-liquid eggs would flow out onto the counter, you just need to beat the eggs slowly until they are completely incorporated. 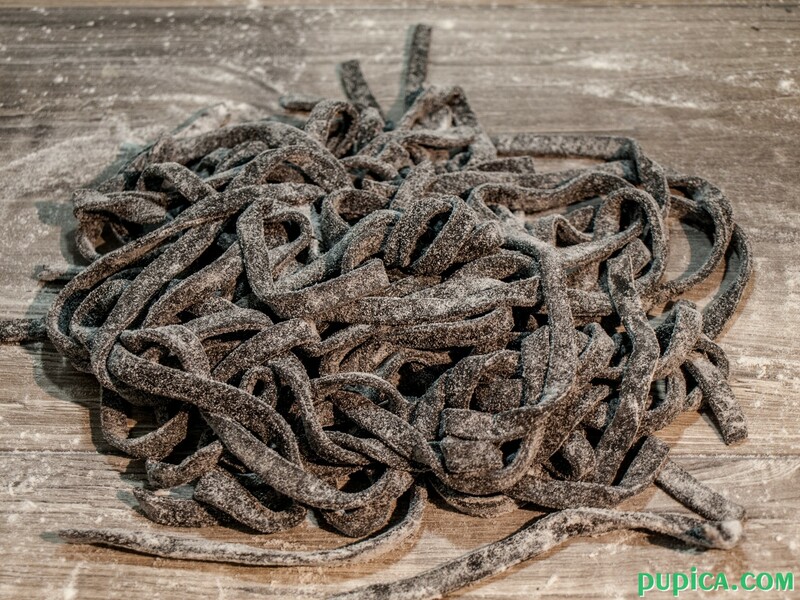 The best thing about preparing pasta at home is that you can play with colors and prepare the dough in various colors with carrots, tomatoes, squid ink, spinach and many other ingredients. Many use food dyes but I try to avoid them and I always prepare colored pasta with fresh ingredients. Of course, if you want to make blue pasta you will think that it is impossible to make it the natural way, but it is not true… I once made blue blueberry homemade pasta and it was delicious and very inviting (I will post the recipe soon). Depending on the recipe you want to prepare you can choose how large you want your tagliatelle to be, although this time I made them a bit larger because of the pasta salad recipe I usually make them very thin, especially if I plan to use them with some liquid pasta sauce. If you have the pasta machine it will do the work for you, so it is really easy to make fresh pasta at home. You can store this fresh tagliatelle pasta in an air-tight container for max 2 days. If you want to store it for a week, you should cook it, slightly coat with olive oil and put it in the fridge in an air-tight container. I prepared a quick and light recipe with this fresh pasta, Tagliatelle with olives, Mozzarella and Arugula. 1Pour the flour onto work surface and make a well. Add eggs and a pinch of salt. 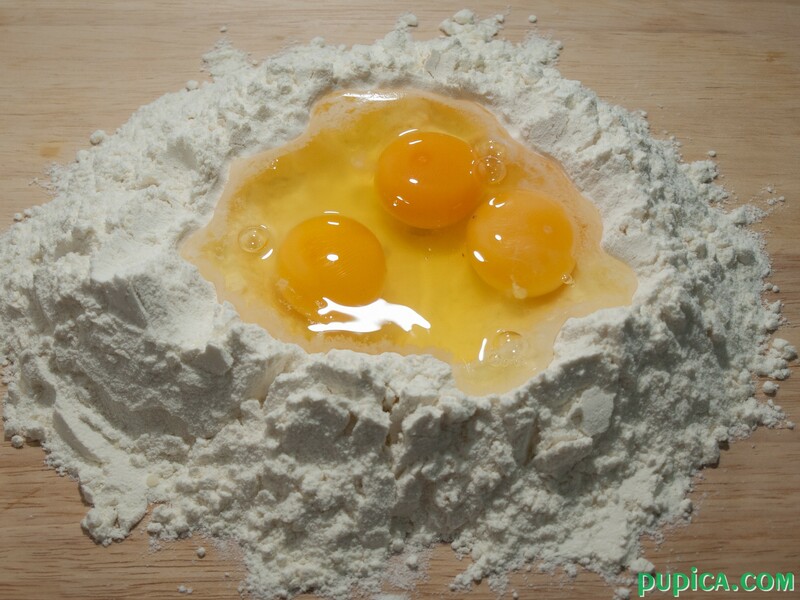 Beat the egg with a fork and slowly incorporate the flour with the eggs. 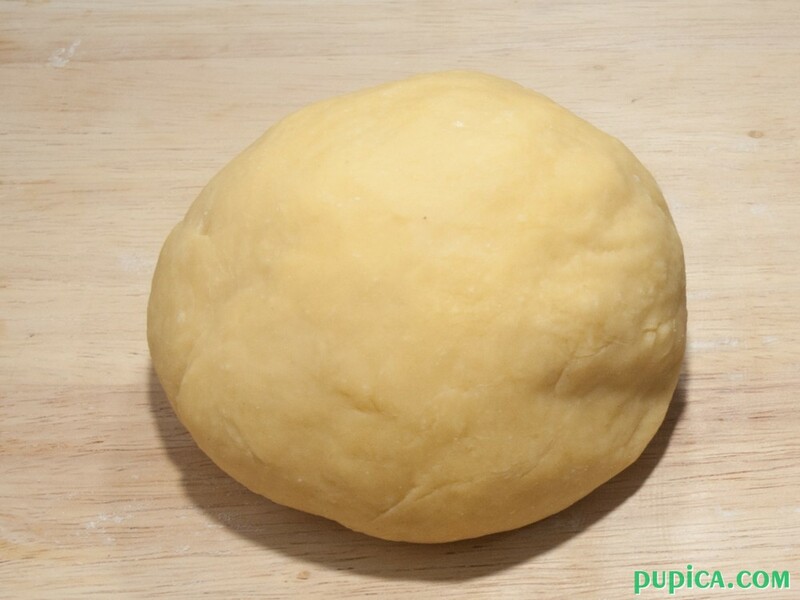 Knead the dough for at least 5 minutes, until all the flour is incorporated and until the dough is tender. 2Cover the dough with a cloth and let it sit for 20 minutes. 3Cut the dough in half and flatten it, then sprinkle it with some flour. Pass the dough through the pasta machine (two times). Then make tagliatelle with it.